Celebrities Are Flocking to Podcasts, but Will They Stick Around? Anyone can launch a podcast, but with their built-in fan followings, celebrities have an easy in. And they've certainly been making the most of that advantage, with a growing flood of celebrities launching podcasts in recent years. Following the path trailblazed by comedy stars like Joe Rogan, Alec Baldwin, Kevin Pollak and Chelsea Peretti, the new tide of genre-spanning celebrity podcasters includes the likes of Corinne Bailey Rae, Anna Faris, Snoop Dogg and Shaquille O'Neal. Are these Hollywood A-listers stealing the limelight (and potential ad dollars) from podcasting's self-made stars? And, given the amount of effort and consistency required to make a consistent podcast, will they stick around? "I think it's fair to say that celebrities steal the attention of advertisers in the podcaster space because they come with a built-in audience," said Mathew Passy, a podcast producer at Radiate, and formerly the podcast producer/tape editor at The Wall Street Journal. 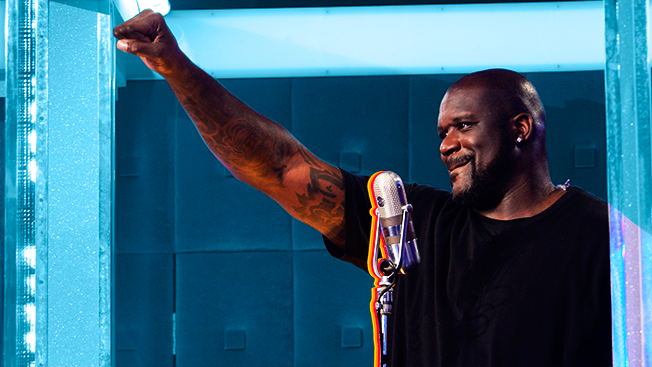 "Shaquille O'Neal could fart into a microphone for an hour and 100,000 people would download it, while other podcasters are putting out great content advertisers [don't pick up on], because for advertisers there's a high threshold," he said. "If you don't have 10 to 50,000 downloads, most advertisers won't bother." for their take on celebrity podcasts. You don't need an advertiser to endorse you to prove your podcast is great, but you may need those brand dollars to actually sustain your career and, in an admittedly chicken-and-egg situation, to get more followers. "A lot of podcasters are just getting lost at sea and talking to themselves like [so many people] on YouTube," Passy said. But it's hardly all bad news for non-celebrity podcasters. Podcasts like Serial, Nerdist and Radiolab are just a few that have widened the playing field for original, clever content. And while those shows were built on existing media entities, they've led the way for truly original hit content like Lore, Song Exploder and the burgeoning Gimlet Media. The key, podcast pros say, is to do something that no one else is doing, and to do it better than anyone else can. Sometimes that's a bar too high for aimless celebrities to surmount. Some celebs have already dabbled with podcasting and moved on. Lena Dunham did a 5-episode "podcast miniseries" in late 2015, the same year comedy wildman Russell Brand did 14 episodes of a podcast over three months before dropping off. The shows that will likely succeed in the long run are those that have a consistent reason for being. "First and foremost, successful podcasters are doing something unique," said Passy. "They had a great launch strategy, and built up a small following before launching." Also, while celebrity podcasts may get hype and score downloads galore, they don't necessarily have a ton of die-hard fans. Winq, a social media app for millennials that launched earlier this summer, asked its users about their feelings on celebrity podcasts and found that 52 percent of them didn't even know that celebrities made podcasts. An even greater percentage scoffed at the very idea of celebrity podcasters. "When we asked how they felt about celebrities making podcasts, 67 percent said that they don't take celebrities seriously as hosts, since they seem underqualified," said Lindsey Cummins, co-founder and CEO of Winq. Winq users also weighed in on what celebrity they'd like to see make a podcast (Rihanna over Miley Cyrus by a landslide vote), and which they prefer of the existing hosts (Alec Baldwin beat out Anderson Cooper). But still, celebrities have a better chance at reeling in listeners, at least off the bat, then non-celebrity podcasters. "Like with most things, it's easier for celebrities to succeed," said Brian Adoff, founder of Riveting Digital Media. "In podcasting's early days, it was possible to grow a show's audience organically; however, now with the massive amounts of competition, it's difficult for a new podcaster to find an audience without any kind of marketing or promotion. It's similar to blogging [where it is foolish] to write content and hope people will show up to read it. Just because you build it, doesn't mean they'll come. Same goes for podcasting."